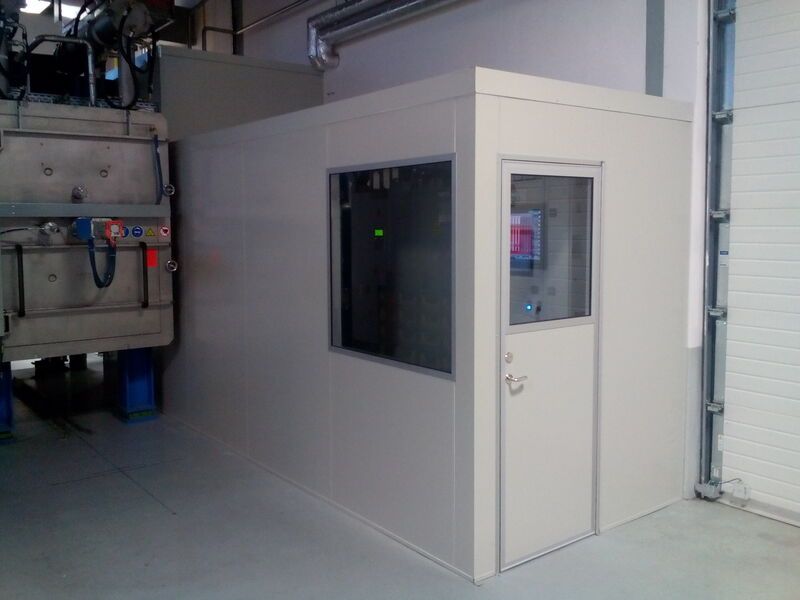 Noise shelter for a distributor of a special-ceramics furnace. The noise shelter consists of three walls and a ceiling and a superstructure to cover the technological lines. It is fixed to the existing envelope wall of the hall. The dimensions of the shelter are 1.8 x 6.2 m, height 2.5 m + 0.8 m for the superstructure. Both shorter walls are fitted with opposite facing doors, so that the distributor can be accessible to the operators. Also, when the distributor is not in operation, the doors remain open and the shelter can be walked through so the standard operations in the workplace are almost unlimited. A window is located opposite to the control panel and is used for monitoring the correct operation of the system. The panels are perforated on the surface facing the source of the noise to improve their acoustic effect.